Watermelon Salsa is summery, fresh, sweet and spicy. Top grilled fish or chicken. 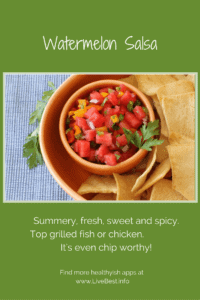 This salsa recipe is even chip worthy! I think salsa is the little black dress for a chicken breast or fish filet. Salsa is Spanish for “sauce.” It could be a cooked sauce or a fresh mixture. Fresh ingredients make it one of the easiest flavor boosters around. It’s also a great way to repurpose some fruits and vegetables. Salsa typically include some heat such as jalapeño, serrano or habanero chiles and some tangy acid from lime, lemon or orange juice. The combinations are only limited by your imagination. ‘Course you know about salsa made from tomatoes, jalapeño and lime juice. I’m thinking bigger, better, more here. 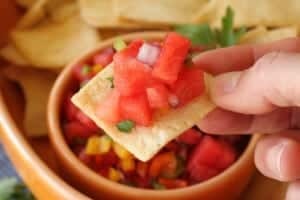 Think Watermelon Salsa! Watermelon is one of summer’s best gifts. 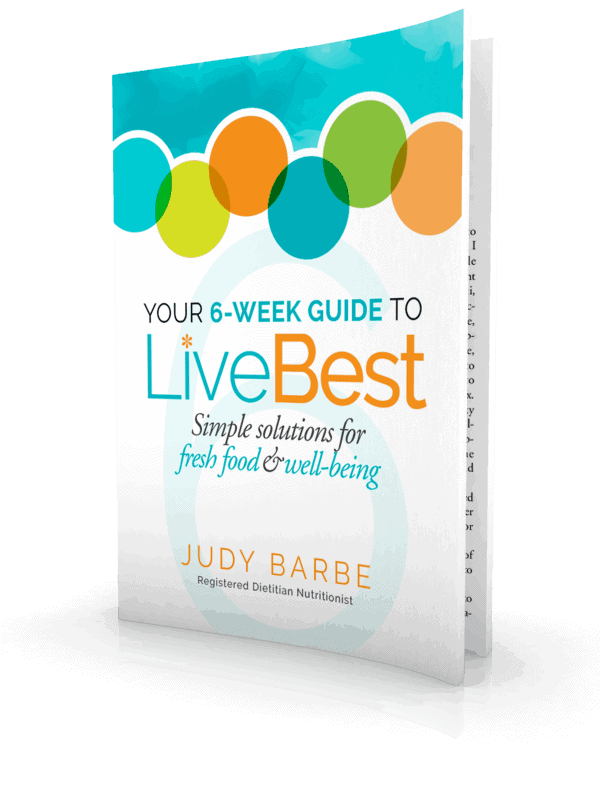 Buy it during summer when the fruit has time to develop maximum flavor by ripening in the sun. In choosing a watermelon, give it a good look. You’re looking for a firm, symmetrical melon that is free from bruises, cuts, or dents. The underside should have a creamy yellow spot. That’s where it sat on the ground and ripened in the sun. After the viewing, pick it up – it should be heavy for it’s size. True to it’s name, watermelon is 92% water, which accounts for most of its weight and its name. That high water content means watermelon is low in calories. Just 50 calories per cup. Once home, rinse the melon in running water, no soap, and pat dry. Cut it with a clean knife. Watermelons can be stored at room temperature for a week but once it’s cut refrigerate, please. Watermelon is a lycopene leader among fresh fruit and vegetables. A plant pigment found in only a few red foods such as tomatoes and watermelon, lycopene may help to prevent prostate cancer and reduce the risk of heart disease. A deep-red watermelon has more health promoting lycopene that a semi-ripe one. Summery, fresh, sweet and spicy. Top grilled fish or chicken. It’s even chip worthy served in a cute dip bowl. Cut the peppers and onions into similar sizes so they blend together. You don’t want to make this too far in advance because the watermelon will releases juices and may it rather sloppy. Though you could drain off some juice and serve with a slotted spoon. 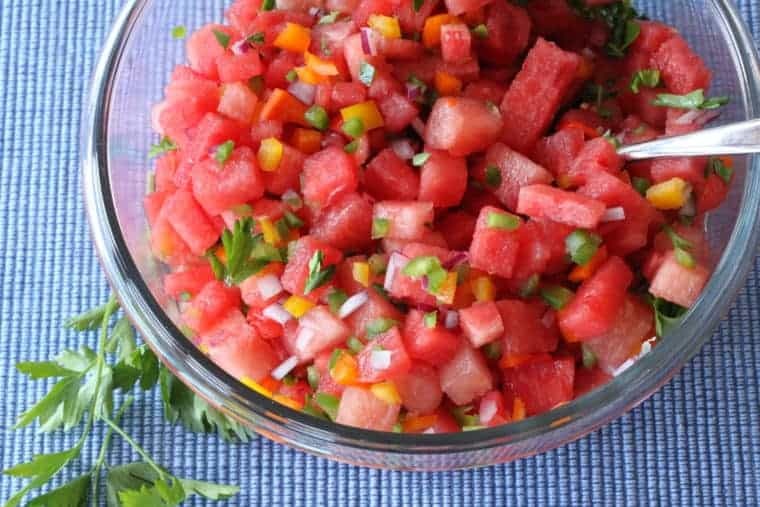 You may also like this Watermelon Salad with Soy Ginger Vinaigrette. 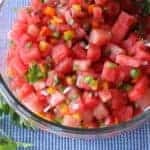 Watermelon Salsa is summery, fresh, sweet and spicy. Top grilled fish or chicken. It’s even chip worthy! Combine all ingredients in medium bowl. Toss gently. Serve over grilled fish or chicken. Or serve as a salsa with chips. Note: Substitute cilantro for parsley. Or try other fresh herbs. You can use all orange or red pepper if you don’t have a variety on hand.